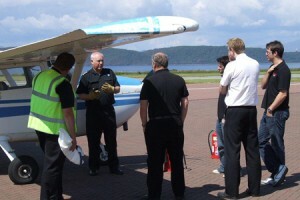 Whether you’re a pilot looking to update your safety skills or an employer who wants to make sure that their staff know how to handle a situation safely, our Fire Extinguisher Training could be just what you’re looking for. Our experienced team work with small groups – usually around 12 people – to deliver sessions involving presentations, demonstrations and practical applications where appropriate. 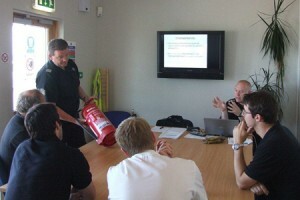 The workplace training reflects the requirements of the Fire (Scotland) Act 2005 and the Fire Safety (Scotland) Regulations 2006. The aviation course is in accordance with Official Journal of the European Union L254/197 Appendix 1, Ops 1.1005 and 1.1015. On completion of the course, each delegate will be presented with a certificate detailing the course content and confirming his or her participation. 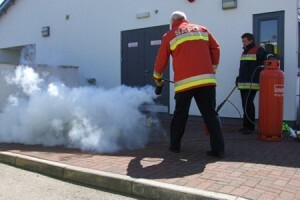 Fire Warden Training is also available and bespoke fire training courses can be arranged locally, contact Oban Airport for details. Please note that it may not always be possible for these sessions to be held at the Airport. Should this be the case, the course may be delivered at a suitable alternative venue. Please be assured that these venues are carefully inspected to ensure their suitability.